Coming from the world of RV travel we called our Smart car our Dinghy. From our experience, we put nearly as many miles on our Smart as we did on the motorhome. We pretty sure all the same rules will apply with our sailboat, so we’re not taking this dinghy swap decision lightly. Since the first day we looked at our sailing catamaran we knew the center console dinghy would have to go. Mainly because of the weight. The heft was causing stress cracks on parts of the boat. 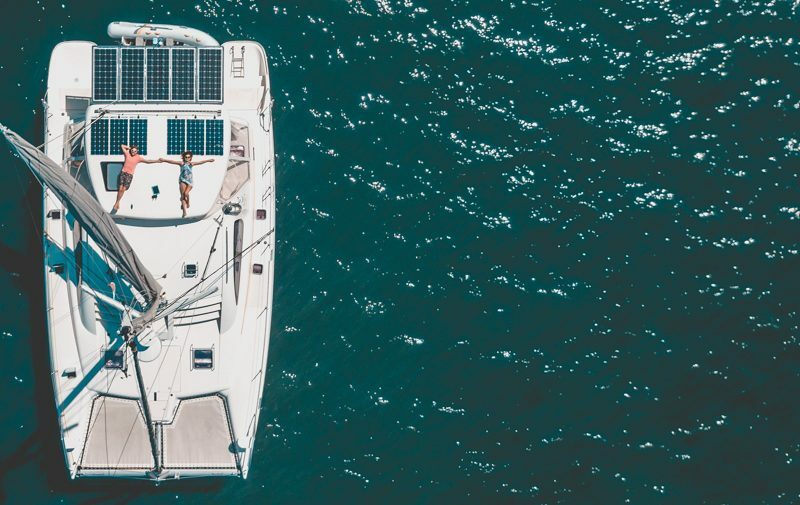 For the past six months we’ve been researching, talking to fellow sailors and picking the brains of every cruiser we’ve shared a sundowner with. We’ve taken all the information, coupled it with our personal needs and now we’re swapping out our plush dinghy for something more practical. As we mentioned in the video, there is only one reason we ended up with this dinghy: The seller of our catamaran wouldn’t sell the boat if we didn’t buy the dinghy too. Don’t get me wrong, it is a great dinghy and a very comfortable means of getting around. I can see why the previous owner loved this dinghy. 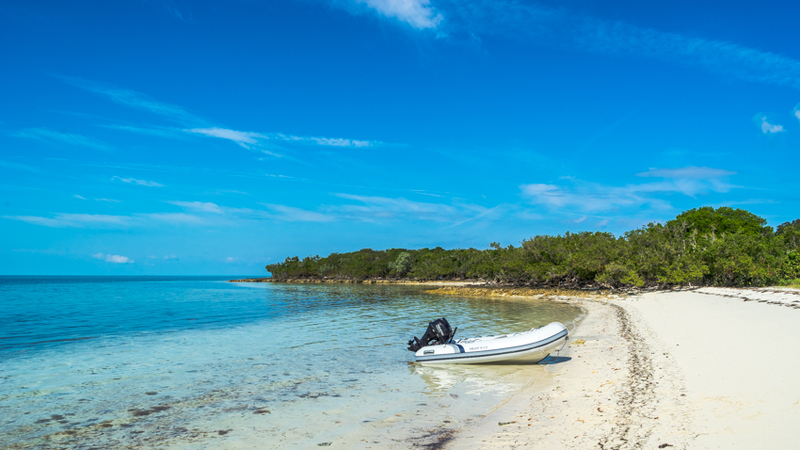 For a retiree cruising the Bahamas a few months of the year, it’s a super plush ride. If I were him, I would’ve gone for the same thing. The biggest problem for us was the weight. It was far too heavy for our boat and we were advised by Kent (Just Catamarans) and Brian (our surveyor) to get a lighter dinghy. Aside from the weight, its flashy (hey look at me, follow me back to my yacht for expensive & fancy stuff!) and impractical for the type of cruising we plan on doing. The molded seats and center console take up a lot of room. We need space for dive gear, folding bikes, big provision runs and who knows what else. We need a dinghy that can take a beating on all the crazy adventures we have planned around the world, not a luxury cruiser. While doing my research, I did find there was a running theme: Your dinghy is your car. Get the biggest, deepest dinghy your sailboat will fit and the largest motor you can afford. I kept that in mind as we virtually shopped around for our perfect cruising dinghy. For about 2 seconds I tried convincing Jason we should go with one of the unsinkable ridged boats like the Portland Pudgy. They are heavier and smaller but they can also be used as a self-rescue boat. I do still like the idea but it didn’t take long for Jason and Kent to double up on me with all the reasons why a rigid inflatable boat (RIB) was a smarter, more practical all around dinghy for our future about-the-world travels. There were two big brands that stuck out as the best dinghy for sailing cruisers. AB and Highfield. Both have nice deep hulls, good space, and great reviews on ride and durability. We searched heavily for something used from either brand and found nada! I suppose that is a good sign. If you buy the right dinghy, you will use it and won’t need to sell it. So, a spankin’ new one is our only option. The Highfield stood out with a few bells and whistles. Double deck hull (any water drains down to the lower hull to keep feet and belongings dry, helpful when provisioning). Seats have cushioned canvas covers with storage pockets, and they are fully removable to make way for gear. It’s not as common. Seems everyone around us has an AB and we like to be a little different when we can. It’s a tad cheaper and we’re all about saving a few bucks where we can. Yamaha and Tohatsu seemed to be the two prominent brands among cruisers. Both were touted as easy to get parts from a worldwide dealer network (also because of popularity around the world), low maintenance needs and generally reliable. Through my conversations it seemed there were a few more Tohatsu fans we spoke to who had good customer service stories (customer service is critical because when you need it, it means something is wrong and you need help) and it was slightly cheaper than the Yamaha. We went above the maximum 15HP recommendation and purchased the Tohatsu 20HP. Say what, above the recommended amount?! Basically, a 15hp is a de-powered 20hp, meaning you get all the size and weight with less horsepower! That just seemed silly, so we opted for the extra power. Our outboard motor is a four-stroke. We seriously debated waiting till we arrived in the Bahamas to purchase a two-stroke engine because that seemed to be everyone’s advice. The benefits of a 2 stroke are (generally speaking): lighter weight, more powerful (i.e. faster to get to a plane), more compact size and easier to service. The downsides: Less eco-friendly, louder, smelly exhaust, omits more emissions into the atmosphere, required to add expensive oil separate from fuel and most importantly we weren’t sure of the dealer and warranty situation. The environmental aspect of the downsides was a big one to us. Call us tree huggers if you want (I consider it a compliment) but our planet takes a beating and if there is an option with a lesser impact, we’ll take it. It’ll be interesting to see what happens when our engine breaks down for the first time. Will we be able to service it ourselves or is it so complicated we have to bring it in? Let’s hope our mechanical skills have time to improve before that happens. 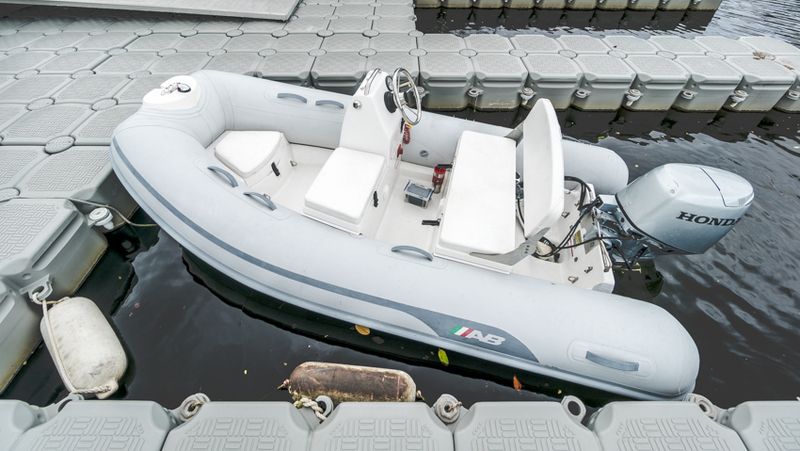 We didn’t go crazy on extras and wanted to keep our dinghy simple, especially for now. Extra seat – It comes with one (canvas covers are included) but we knew we would want the extra seat for guests (we were thinking of you mom). Potential Future Project – I am considering making chaps as we hear it helps prolong the life of the dinghy. But honestly, we have tackled so many boat projects over the last six months…I had no desire to take on another multi day project yet. Our dinghy did come with plenty of extras like a pump, patch kit, oars, dry bag, etc. so we’re set on all that for now. Another thing that drew us to the Highfield brand is the “add a center console” option (it’s called FCT console). Pull up the rubber non-skid panels and a few threaded holes are revealed. 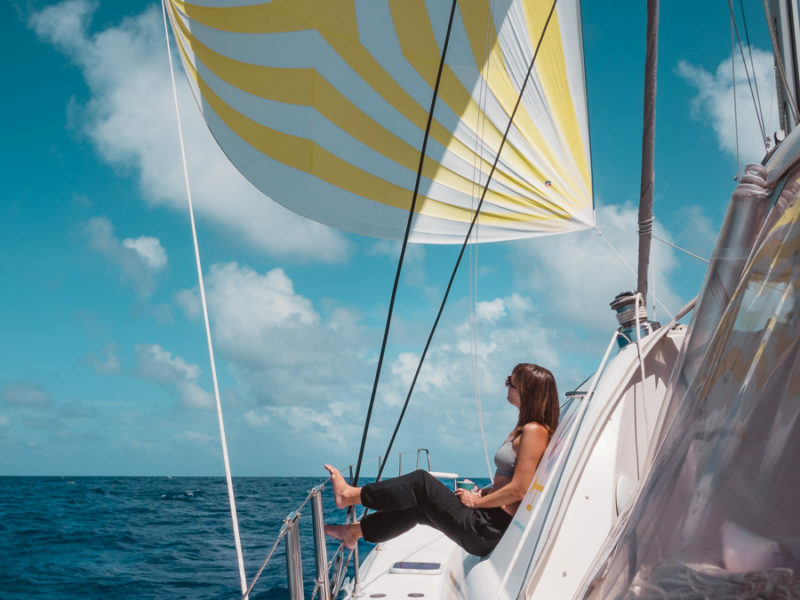 It’s supposed to be a drop-in addition for many of their dinghy’s and it doesn’t monopolize as much space as a traditional fiberglass center console dinghy. Who doesn’t like flexibility!? If we decide someday we don’t like the throttle on a stick we currently have, we can always upgrade. That’s about it. If we’ve left anything out that you are still pondering, leave us a note in the comment box below. If you have a different take on the best dinghy for a sailing cruiser, please share your thoughts. It’s always interesting to hear what works for others because this isn’t a one-size-fits-all kind of thing. We all do things a little differently and we learn from each other along the way. Hi Nikki and Jason . I have noticed you now have changed to a Yamaha 25 hp motor . That’s what I think I noticed binge watching a load of you videos from a year back . Can you tell us the reason why the change . We are about to buy the Highfield 340 , and we’re going to fit the Tohatsu 25hp . I have had both in the past , both good brands . Oh , I know you’ve heard it before , absolutely great videos. I have been sailing since 1975 , so am so impressed by both of you . The Minion is actually their third dinghy. I the “dinghy swap” video they moved from the plush dinghy that came with the boat to the Highfield 310. They later added a note to that blog post that they wished they had gone with a slightly larger Highfield because they were planning to bring crew aboard and the 310 has a 5 passenger capacity. Highfield saw the post, reached out, and offered to swap them up to the 340. That is when they moved to the larger 25hp motor. I think they mentioned that it is slightly overpowered when it’s just the 2 of them, but for 4 people with dive tanks they appreciate the added umph. As for Yamaha vs. Tohatsu I’m not sure why they switched. They weren’t unhappy with the Tohatsu that I know of and it may have just been a matter of availability. Maybe they’ll chime in here to clarify. Currently binging from the beginning. Yes indeed! You nailed it. We also really love our new Yamaha because of the new 4 stroke tech that is lighter weight, more environmentally friendly and quieter. It makes the choice of 4 stroke vs 2 stroke a no brainier! Just discovered your web site. We are waiting to take delivery of our new Highfield Classic 380. Looking forward to semi retirement soon with more time for sailing and skiing. Be safe out there. Random question – did you guys ever come out ahead on the dinghy swap? I find myself in a similar situation, looking to trade a new, fancy console dinghy for something more practical. What did you end up getting for it? We did come out ahead. The center console sold for $8,500 and we are still very happy we traded it in. Just found your website and love all the information – thank you! Hi! 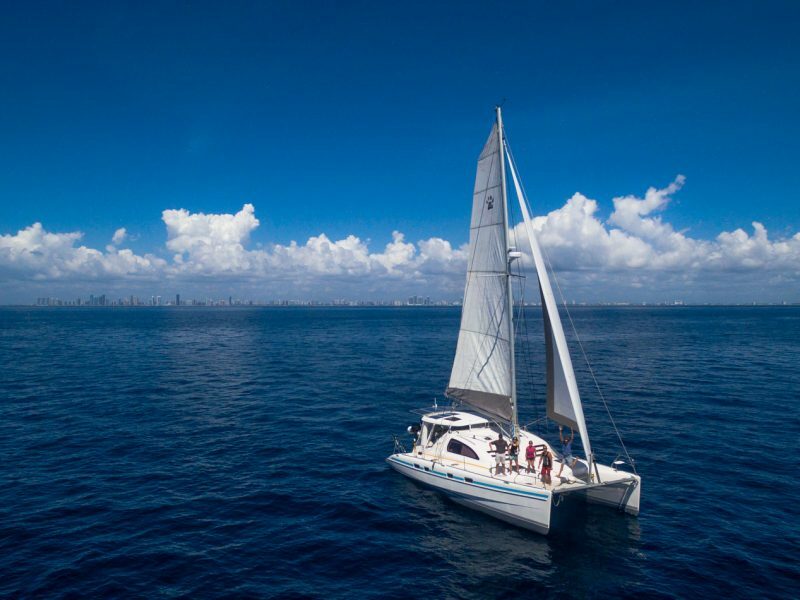 My husband and I are just closing on a liveaboard/cruising sailboat, and we need a dinghy. We’re looking at the Portland Pudgy, but you mentioned Jason & Kent had a ton of reasons why not to go that way. Could you (or did you already?) expand on that at all? We have a 5yo, so he’s a part of our equation as well. Thanks so much, and we love the videos! Mainly it was the max hp for the engine. Often times we’re anchored a few nautical miles from town, or snorkeling, etc. With a 20hp engine it’s quick and easy to get from the boat to the land, with a tiny engine a 2 NM trip could take a half hour in waves and wind making for an unpleasant ride. 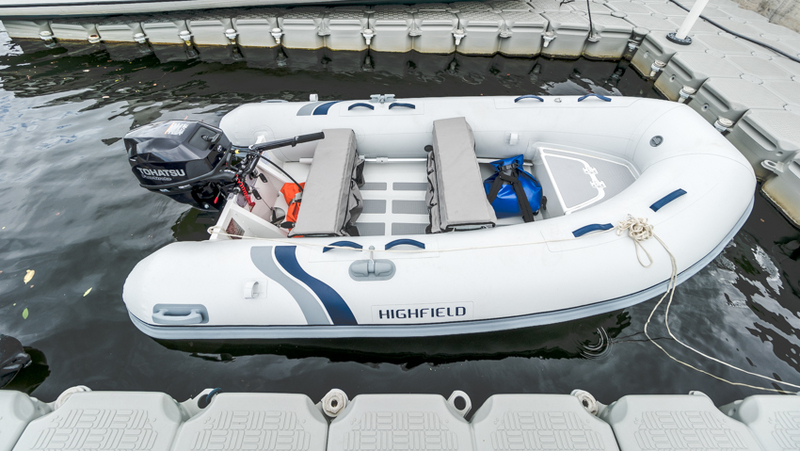 The RIB is the standard for a reason, and a good brand like Highfield (or even AB) will provide a safe, comfortable & dry ride even in not so perfect seas. The 20HP is great, only thing missing is a plane fin which we’ll add soon. I just watched youre dingy swap. Highfields look nice ,good hull shape. I am also considering the 310 classic or 340.single floor. I am in thailand and they are available here . My caribe 11 foot light has been awesome for 12 years. Its on its last year i am afraid .i think AB is sister companys to caribe. Anyway big decision cause its once a 10 year purchase we all hope. Try sitting on the other side. Using youre left hand to throttle.You have way more stability in youre arm stretched out. If you hit chop you can strong arm it. And you wont just get thrown out. Enjoy youre videos. Keep it up. Good choice on the smaller dinghy. The first time you do a beach landing with heavy surf you are going to appreciate it, as you will be able to drag it up the beach so it doesn’t fill with water. And when you leave the beach have one person in the water to keep the bow into the waves. First person starts the motor and then second person jumps in as you power out. We just purchased a Highfield 380 CL at the Miami Boat show. We will post a review on our channel. We will see if bigger is better! Awesome Stan, you are going to let us know how you like it and if bigger is better! My wife and I really enjoy your website, blog, and especially your YouTube channel. The new dinghy davits looked functional and practical. It looks as though you took your cue from the davits Robertson & Caine have been installing on their catamarans for the past 5 or 6 years. I assume Just Catamrans did the installation. I’m curious about the electric winch system you have installed. Who is the manufacturer and what are the specs? Are you happy with it? Our Lagoon has similar davits, but Lagoon does not offer an electric winch that mounts under the bimini. I think your installation would work on our boat. Congratulations, the two of you have really come a long way as sailors in a short amount of time! The upgrades you’ve made to s/v Curiosity seem well-thought out and well done. My wife and I have been sailors and boat owners for many years and you have entertained us, informed us, and inspired us with your adventure. Well done! I follow your site every week did I miss your sail to the Bahamas? You seamed to have ended there without filming you’re sail. As a sailer my self and interested in sailing to the Bahamas too I would be interested seeing how you did. You didn’t miss the crossing. That is coming up (we are keeping all the videos in order) but wanted to give a quick little update to how the new dinghy was working out. We wouldn’t dare not share our first big trip! Hey guys…did the same thing you did with the smaller dinghy. Never looked back. Wondering which Tohatsu you got. I’m going up in hp also and want to know if you opted for the long or short shaft version. Also heard Tohatsu makes the Mercury so it is a close relative in the parts world. Keep cruising. I’ll be coming back through the canal later this year so who knows, we might cross paths. Hope you keep enjoying the lifestyle. Lots of good folk out here. the ones made with Hypalon (now called something different) were much more tolerant of UV rays. But if you keep your dinghy covered when not in use, it should last a long time. use a 100:1 gas to oil ratio, which is quite lean and doesn’t smoke that bad. engine when you pull the dinghy out of the water (only is using in salt water). For me I’d have an eperb and a good survival raft. Sorry to say but the dingy is useless if your boats going down in bad weather. I had a 50ft Ocean Yacht and had this survival equipment and almost had to use one time on my way to the Bahamas some yrs back. Water is a powerful force as I’m sure you know. Love watching. Glad you made it to the Bahamas, safely! It’s getting cold here in the north. I’m sure you don’t miss it! Love your blog! Don’t forget your PFDs ALL the time! A vest model or even a small belt model could make the difference if you end up in the drink. Blog topic maybe? Did you mean “emits” instead of “omits” when talking about the pollution the 2 cycle engine produces? I know your writing is quite meticulous. Love your blog. Any plans on come down south to the Leeward/Windward islands of the Caribbean? Please consider dinghy chaps, sooner, rather than later. While cruising you will often tie up your dinghy on various piers. At low tide, the dinghy can scrape under the pier and cause a puncture in the tube. We’ve seen it happen several times. Good choice for you. I just love watching you two. Glad you are enjoying the Bahamas. See you on your videos soon although in person would be awesome! Just a thought to consider if you havent already would be register your business (which is now clearly marine related) with Port Supply to get a Port Supply business account. Port Supply owns West Marine and when you go into WM and give them your PS number, you get significant savings. It depends on the type of merchandise but it’s not uncommon to save 15-35% per item at West Marine. Plus you can call port supply and they can get things to you asap wherever you are. 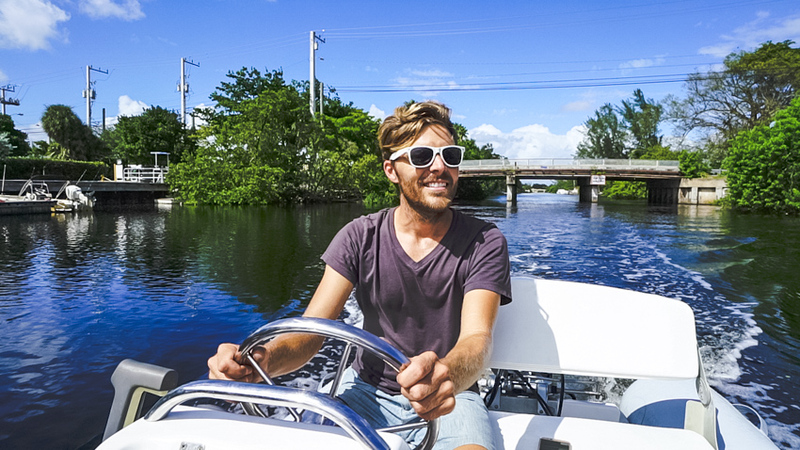 There’s a reason the “helm” on an outboard is off center to the left of the engine. It’s so that the driver sits to the right of the boat. This way the driver has full range of movement with the helm, and his/her weight is more centered (since he/she has to lean in somewhat), which is important on a smallish boat. An outboard is meant to be operated with the left hand, with the driver sitting on the right side of the boat. Keep up the blog and videos : I love to read you ! I also lean toward 4-cycle, so I would look for a 4-cycle diesel outboard engine. Every engine will have pollution problems as it wears. The 2-cycle diesel will always have a problem with burning oil and that gets worse with wear and injector pump issues. The 4-cycle gas will wear its plugs and wires and be susceptible to moisture shorting. The bottom line on all engines is to have the electronic diagnostic software and necessary connector to diagnose it on your computer from wherever you are. Just plug it in and call someone. All modern engines should have that capability. I was surprised being the self proclaimed “tree huggers” that you didn’t opt for a better environment option like a propane “Lehr” outboard or even a “Torqeedo” electric outboard. They are now globally serviced and are somewhat trouble free. They even have options matching horse power to the 4 stroke. Just my two cents! I am sure you looked into them. Love following your adventures! You said some commented not to swap your dingy. I just don’t understand why the opposition. You have so many valid reasons, but for me two stick out. The one where you might be targeted for robbery, which i understand is frequent in some ports, and lowering the weight that improves ability to beach then back to the water. Stay safe and have lots of fun in the Bahamas. Love your videos and I am anxiously awaiting your next with the ship caring ship? Blue water sailors! Looking very happy and relaxed. Just wondering if you can get power trim on a dinghy? Nicki, good call on putting the gas tank up front. Can’t wait for more videos from your tropical travels! Cheers to living outside the wake! Love your lifestyle. You truly are my favorite people. Take me away with you? 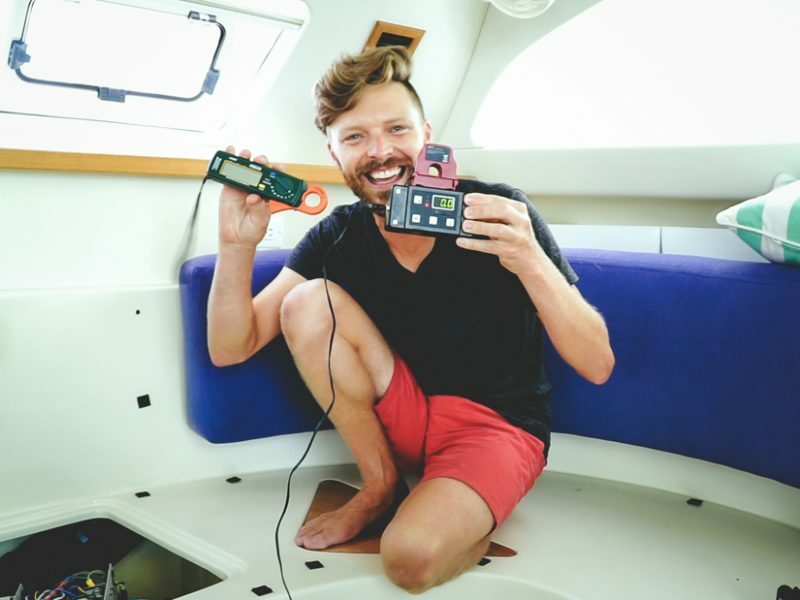 I’m not a sailor and I don’t own a sail boat, but I do follow a few full-time world traveling cruisers on Youtube so that makes me an “expert!” LMAO.. but, I did notice from the get-go that your dingy was waaay fancy with the steering wheel and all the others were inflatable simple boats! Just an observation. So, it didn’t surprise me when you posted that you were downsizing! 🙂 Hugs from waaaay inland No. Cali! You made It! The Bahamas! How many days to sail there? Did you have to motor much? Just the two of you? How dI’d you do the night watches? Tons of question. Can’t wait for the next update. Excellent adventure update. Thank you for sharing the adventures most of us could not do. Motor lock, safety chain, locking compartment for fuel line, gas tanks sometimes walk off too. Tiller extender. Easy lift motor tote. Spare prop. Love you adventures! In the US doesn’t the dingy need to be registered ? I didn’t see any painted on the new one. Did u sell the old one ? Good choice with the 4-stroke. Don’t worry about chaps right away. I always wanted people so see my beautiful dinghy, not a sunbrella cover. As long as you never abraid the hypalon with solvents or abrasives, keep it clean, and protected (303 Aerospace Protectant very good), your dinghy will look good for years, even in the tropics. Maybe the length you chose was the most appropriate. If a longer dinghy just fits, would there be a potential chafe problem as the boat rolls side to side? Hi kids. Try sitting on the starboard side of the dinghy and holding the tiller with your left hand. That way you pull start with your right hand. And you could sit on the aft bench with the motor behind you still controlling with your left hand on the tiller. It’s a matter of preference of course but I find it much more comfortable. We are trying that out now after so many suggestions. Thanks for the tip! So we’ve been binge watching/viewing your vids. 1. We’ve been looking for lagoons (or Cats that are less than 5 years old), here in SoCal. One dealership, no repair shop attached. Did you guys look in SoCal and anyone u can recommend? 2. Do you find it difficult to get fresh veggies every three or four days? What’s your solution? (And Fridge space?). We did try the west coast as that is where we were when we started looking but didn’t find anything promising. There are sooo many more boats on the east coast, especially when it comes to cats. We found the prices to be better as well (probably because there are more boats). Perhaps the savings would be enough to have a captain bring the boat around to cali after purchase? You may want to at least consider an east coast broker. Larry at Just Catamarans ([email protected]) is a fantastic old salt (broker and captain) who could look into the options on the east for you. As for fridge space, since we got the freezer for outside (its listed under fave gear) we feel we have plenty of space. As for grocery runs, those can be simple or more involved…really depends on the conveniences around you. But so far we haven’t had any issues staying stocked up. Love it! So glad you ditched the center console; you’ll find this to be so practical. Most folks I know also take the seats out. More space, less to climb over. Easy and comfortable to sit on the sides. But… Everybody has their own preferences. Seats? Luxury. We just sits on the ribs themselves. As for those suction lights, most people I have seen hold them in their hands while motoring along as the suction is generally not great. We just use head torches in the dingy. Those lights have a provision to be mounted by cementing the bases to the dinghy. Glue one base to the center of the pontoons forward (the bi-color) and the other to the top of the outboard cowl (the all-around). You can then attach the light by pushing the mount into the rubber base and securing it with a hairpin clevis. Do NOT assume they are water proof, remove them when not in use. Moisture WILL find a way inside and corrode them. Use only two part glue intended for Hypalon on the bow. (chloroethelene I think) Epoxy or even superglue will be fine for the cowl light. (all-around white light). Do you really have red and green head torches? Do you assign someone to be port and someone to be starboard? The Evinrude E-tec engines really aren’t that much more polluting than a well tuned carbed 4 stroke. After a bit of use and neglect (because no one retunes their engines to deal with atmospheric changes, and people are really bad about keeping their carbs tuned to compensate for wear) it would actually be cleaner. Also because the fuel injected engine stays in tune much better it is also more reliable. The downside to the E-tec is repairing them in exotic locations. In most places you can find someone with the knowledge to at least get a carbed engine running, fuel injected engines often require computers to diagnose problems, the knowledge and tools haven’t reached everywhere on the planet yet. In reality if you are not on a hard deadline however it should still be repairable, it’s just more of a pain in the… uhh… wallet. ….. what about ” Curio ” for the Dinghy ??? Hi did you add the hypalon option? We did! We want the dinghy to last as long as possible. Excellent choice. You want the ride to shore to be as bulletproof as possible. With complexities come the need for repairs. Easy in Florida, less so in Cocos Keeling (“think we can make a steering cable from that vine over there?”). Excellent thought process and thank you for laying it all out with clarity and entertainment. Warm regards! Dan. I have a 20hp Tohatsu 4 stroke outboard motor and I love it. You are right about the weight it is a bit heavy to tilt but the motor has run flawlessly, for me, almost on a daily basis every summer for the past 7 or so years. Just make sure you check the motor oil regularly. As far as obtaining parts for it, you will not have to, because the motor is very reliable. The only parts you will need are the oil filter and spark plugs. HIGHLY reccomend chaps. The tropical sun is punishing, even to Hypalon fabric. The first sign of a problem is that you notice your dinghy getting dirty quickly, and it becomes harder to clean it. Then the surface becomes seemingly more porous, subtly. Then the surface becomes ever so slightly chalky, in the case of Hypalon, or juuuust slightly sticky in the case of PVC. That’s when you decide you need chaps…. I grew up with 2 strokes, motorcycles and snowmobiles, and I think you’ll be happier with the 4 stroke motor. Less noise and less smoke. If you get the chance, ride with someone who has the 2 stroke, yes, the power is better, but the 4 strokes are much better than they were years ago, so its less of an issue, and cleaner. Nice Choice! I saw you were looking at electric bikes. I opted for an i-Max S-1 scooter for my boat. Very stowable and portable (you can put it in your shopping cart). I feel kinda silly and I’m sure you two get this all the time but, awe you guys are so wonderful. What you do how you take decisions apart and never get over whelmed by all the permutations. You are to be admired and supported.